This was starting to seem a little too easy! Starting the day in Valentine, NE, we had a long way to go to get to our target area: Southwest Kansas / Southeast Colorado. The play was to watch storms develop on the dry line and then cross the stalled front into the highly unstable air to their east and go crazy. We blasted down from Nebraska and managed to get to Scott City, KS in time for storms to start firing on the dry line along the Kansas / Colorado border. 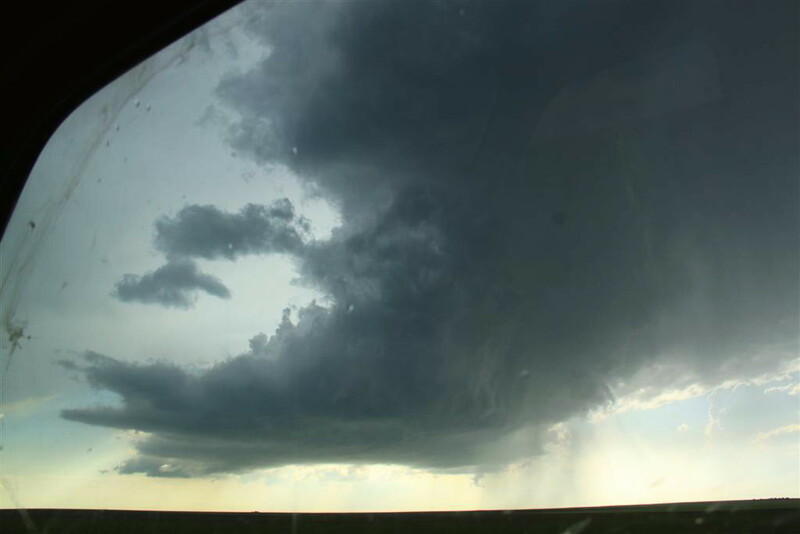 We proceeded to Garden City and then west to Lakin, then decided to head south again towards Ulysses in order to target a storm which had a reported wall cloud and had produced at least one funnel. This would end up costing us as the storm we targeted croaked, while another storm to the north near Tribune produced several landspouts that we missed as we reversed course in Syracuse and charged to the north, but couldn’t get to the storm in time. 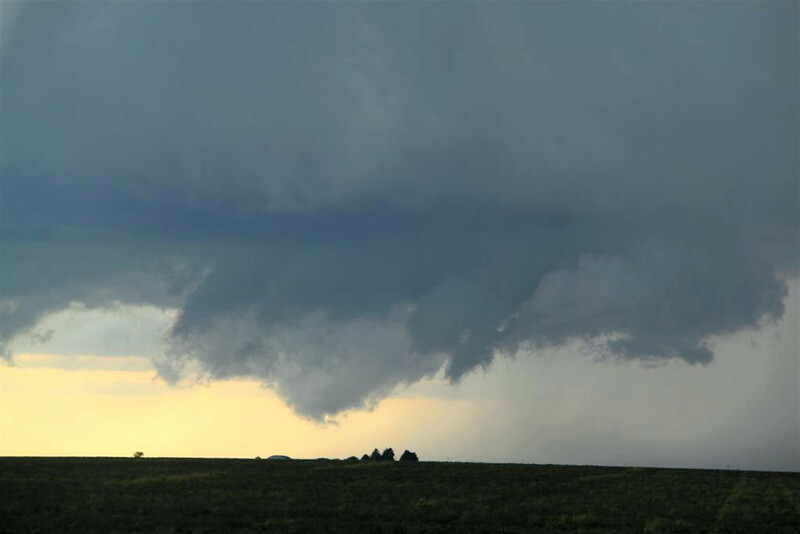 Crossing directly to the south of the meso of the now drying Tribune storm, we headed west into Colorado and turned south at Sheridan Lake to target a cell that had just been tornado warned about 80 miles to the south near Walsh, CO. 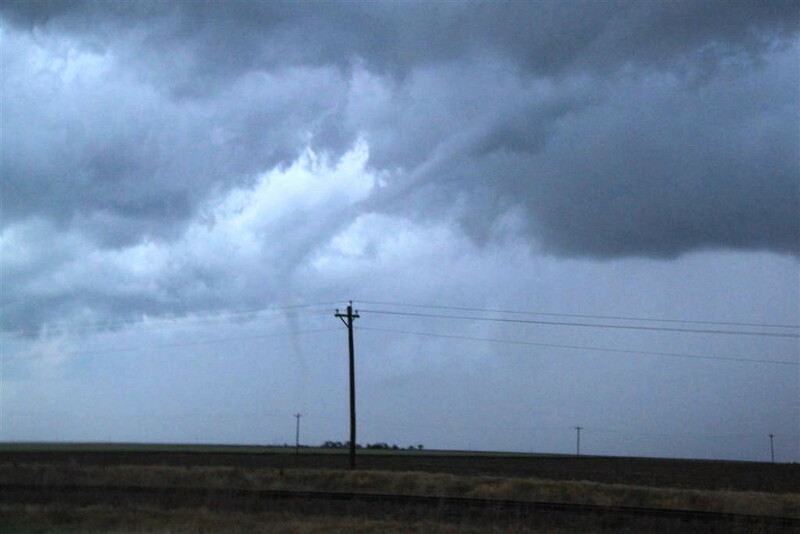 The Tribune storm would much later reorganize and produce tornadoes near Gove, KS. It seems that the forecasted 500 mb winds must not have verified, because all of the storms appeared either anchored to the dry line or barely moving. As we headed south to the Walsh storm then cut across the front of the anchored supercell by turning east at Holly, CO, to our north was a beautifully structured low precipitation supercell with a very low hanging wall cloud that should have been dying but it kept it’s act together for a while, spinning away as we drove from the northwest side of our target all the way to the southeast side without it moving much at all. 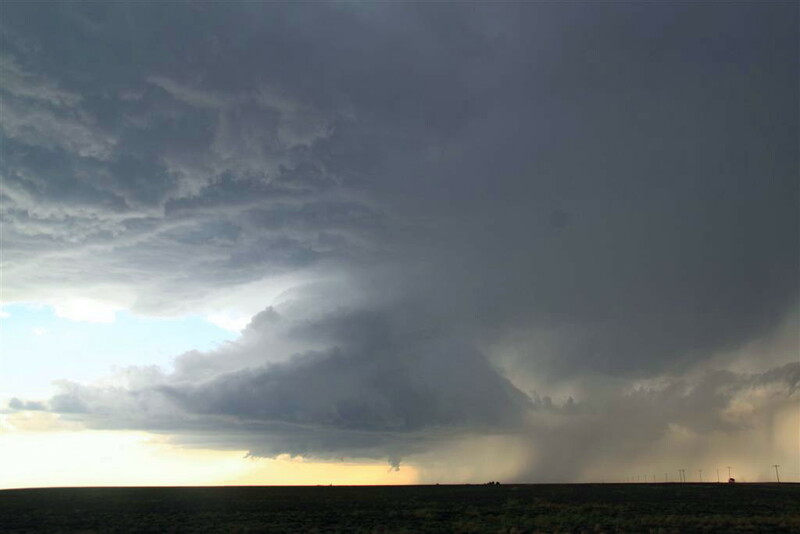 Our supercell was a nicely structured classic supercell with a broad base, but without a well defined wall cloud. 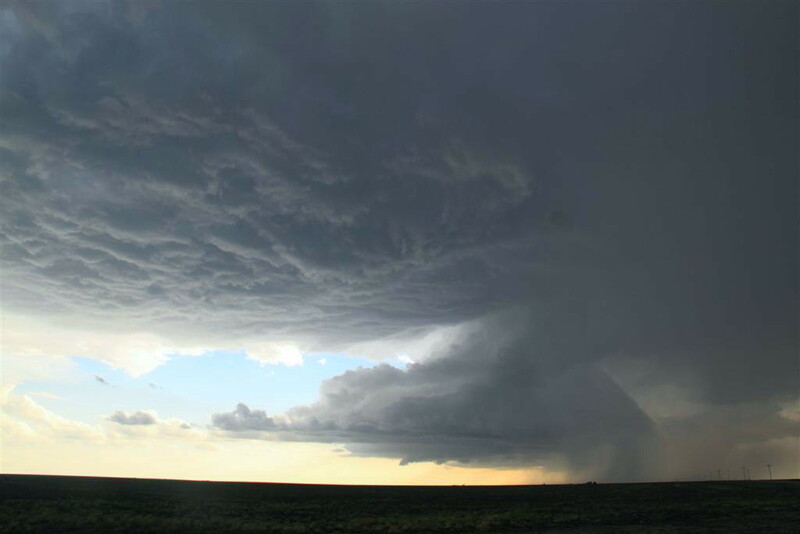 We jumped south from Manter, KS and stopped to watch the structure north of Richfield while Roger took a group down a dirt road west to try and get hail for his Boeing contract. While we waited the updraft really reorganized and pretty soon there was a solid wall cloud with rapid rotation, but it couldn’t get down to the ground. The storm had beautiful structure and was highly electrified. Unfortunately, Roger couldn’t get down the road because of mud and had to come back. This led to a really bizarre (in a good way) occurrence that shows just how lucky this trip was. We cut back across the still barely moving storm and headed southwest, again skirting the core and this time getting a little bit of hail, so that Roger could again look for big hail. After crossing back into Colorado, we stopped in Bartlett and tried to proceed down a dirt road towards Stonington, but it was too muddy, so vans 2 and 3 waited at the pavement while Roger eased his van down the road to collect hail. About this time, it started raining pretty heavily at our location as another cell coming up from the southwest began to interact with ours. Shortly after that I noticed an area to our east was spinning like a top. I mentioned it to Tom over the radio and though it looked like a meso-cyclone I was not sure what I was seeing because it didn’t make sense that it would be there. I continued to observe as the rotation got closer, and abruptly the rain stopped. At this point I was starting to think I should tell Tom that we should move a couple of hundred yards down the road just to be safe, but as it looked to me like the rotation would pass to the east I didn’t say anything. Suddenly, about 100 yards down the road, the trees started shredding and a tornado formed and whizzed across the road at an angle, passing about 50 yards from us!! 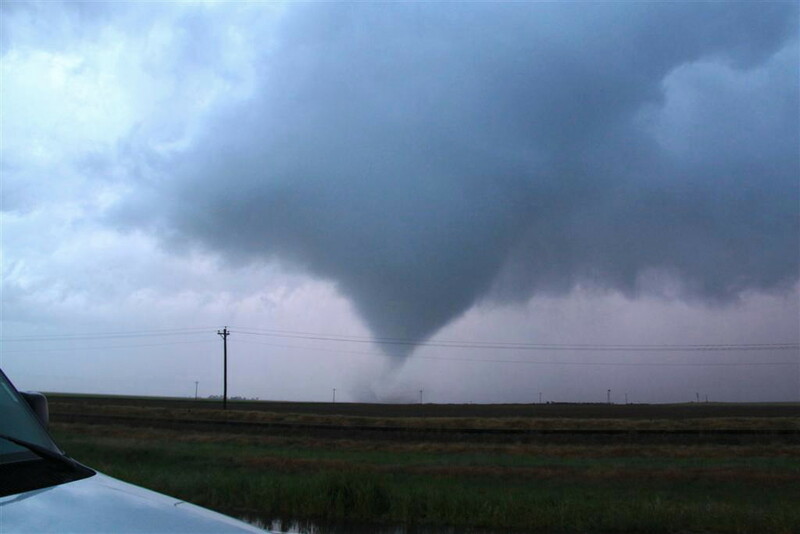 I screamed for Matt to blast west and we hurried down the road with Tom’s van following, but it was obvious that the tornado had already crossed and we weren’t at risk, so we moved back up the road along with van 2, and to the north of us in the field just across the road, a big cone tornado had formed and was churning away with a big debris fan! 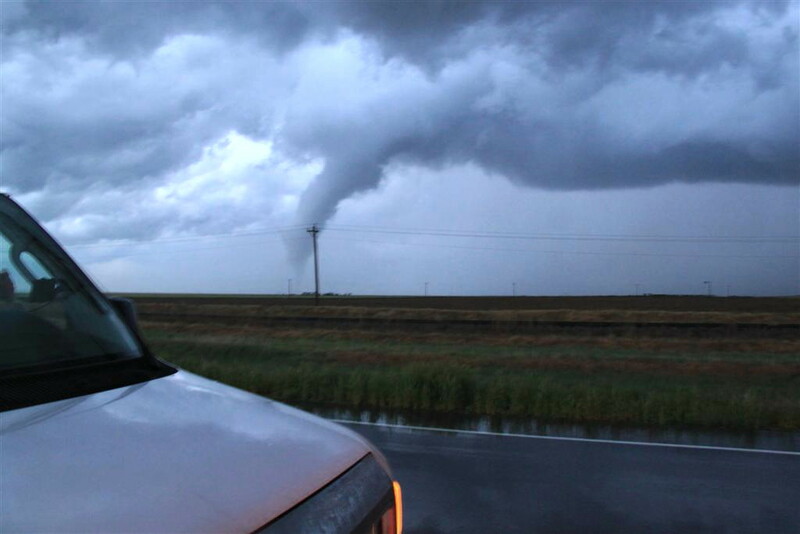 I jumped out of the van and started snapping stills and video as the tornado gracefully slid along in the field for about 10 minutes, and then it finished with a spectacular ropeout! And we got to see it all because we just happened to be sitting there collecting hail! 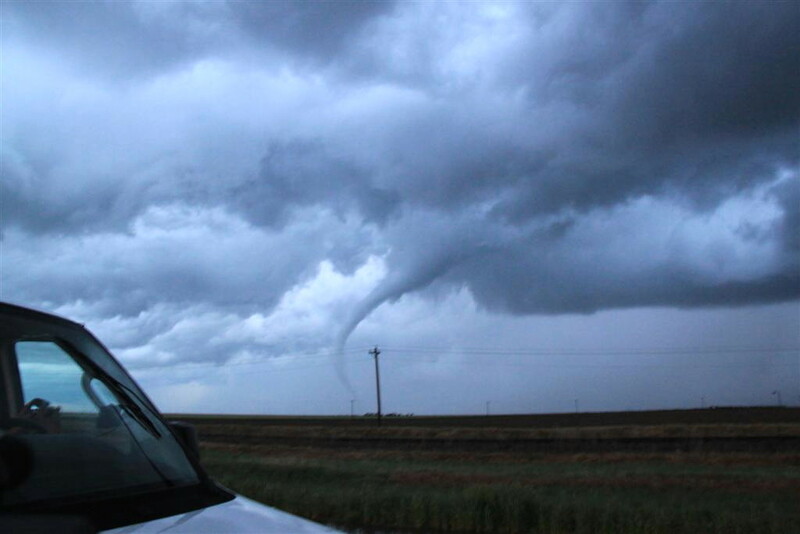 Once the tornado finished, we were getting low on fuel, so we headed to Springfield, CO to gas up and then went up to Lamar where we stopped for the night. What a crazy day!! 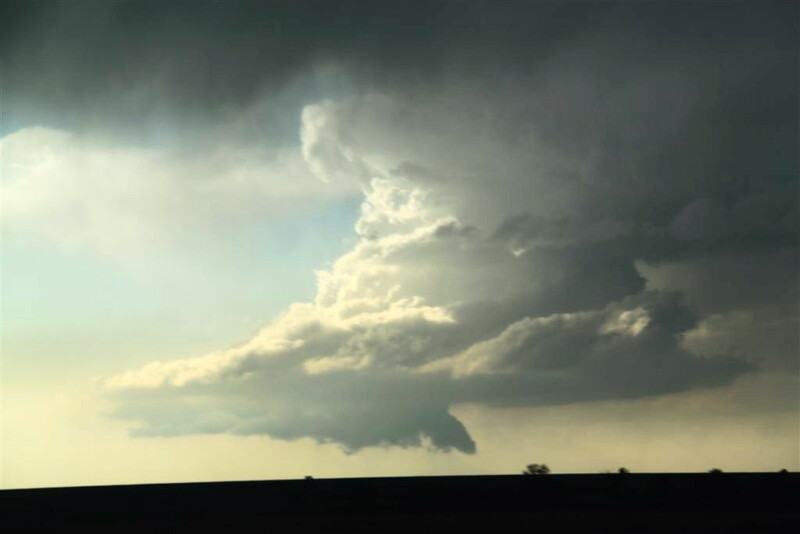 I was more than satisfied with the structure of the LP and classic supercells to call it a successful day, but instead we ended up getting our second really close photogenic tornado of the trip! It was a long driving day with a total of 731 miles traveled. 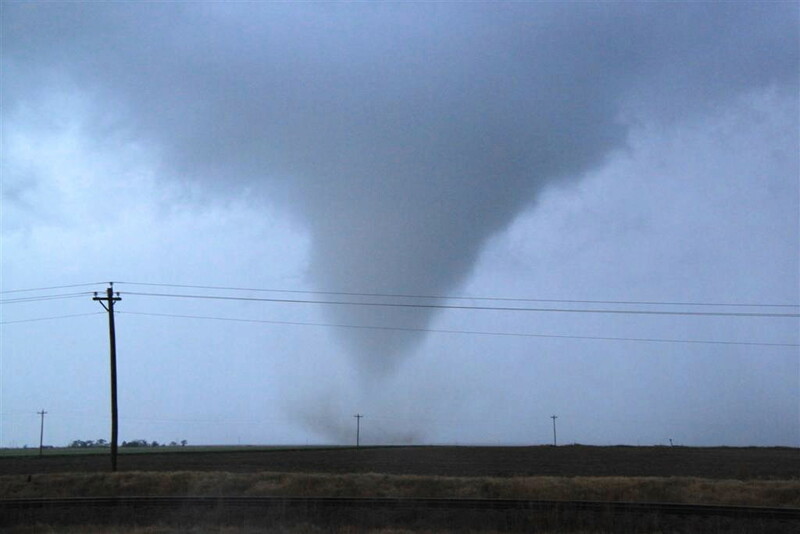 Click here to see the video of the Bartlett tornado. 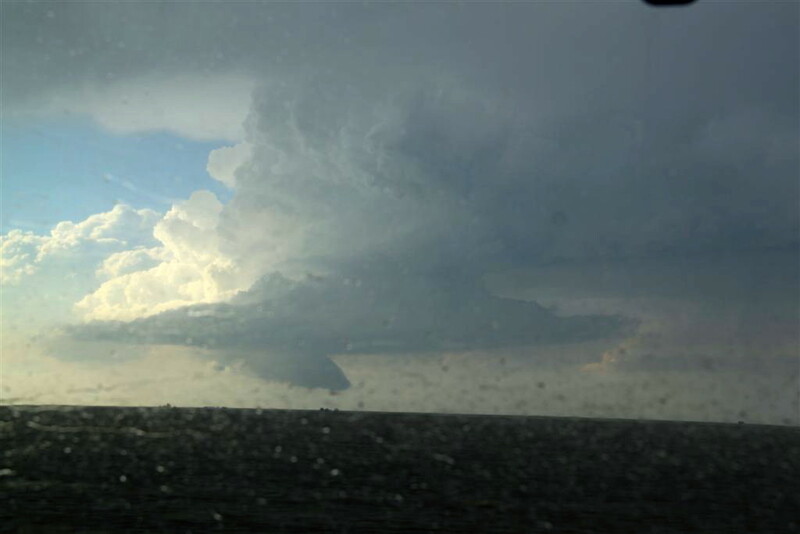 Passing back into Kansas, we intercepted the anchored storm just south of Manter. What awesome structure! The brownish tinge to the inflow band on the right side of the picture was from smoke the storm was pulling in from a fire somewhere, perhaps caused by lightning? As we watched the anchored storm, Roger decided to take his van west up a dirt road to find big hail while the rest of us hung out and enjoyed the view. 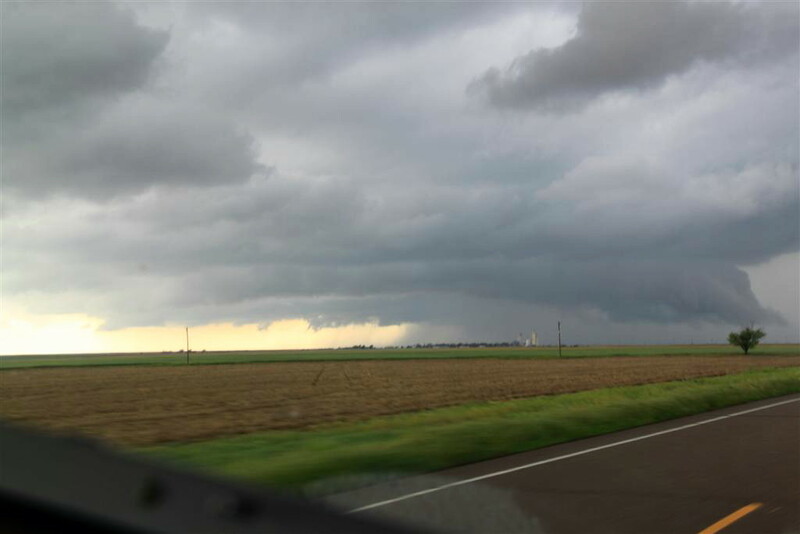 As they headed down the road, the storm began to develop a wall cloud. The storm dumping a big hail core just to it's north. Closeup of the developing wall cloud. For a few minutes, it looked like it might tornado right in front of the van that had headed south looking for hail. Meanwhile, for us waiting and watching, the storm was putting on quite a nice lightning show up in the anvil / vault area. BOOM!!!! That one was a little closer than expected! This definitely got our attention. 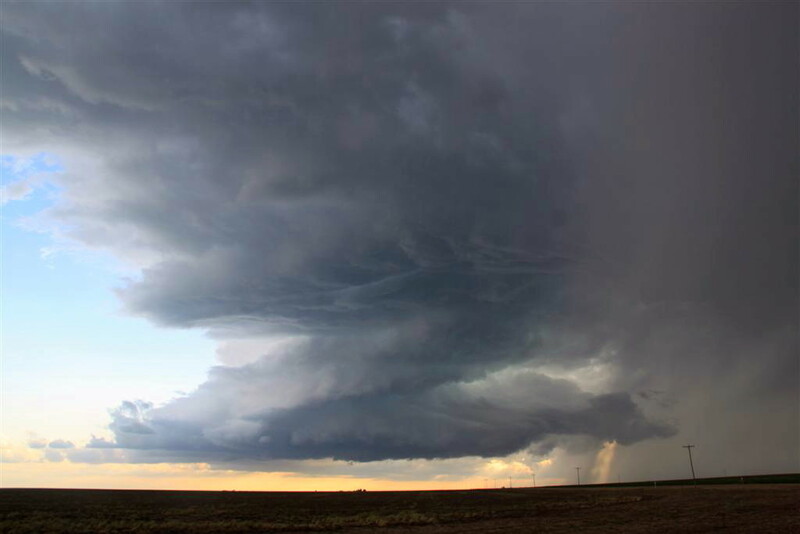 After the wall cloud fizzled out, the structure of the storm reorganized and became even more magnificent! Look at this conveyor belt like updraft! Much later, as we maneuvered back around the storm to collect hail, a tornado developed practically right on top of us very unexpectedly! 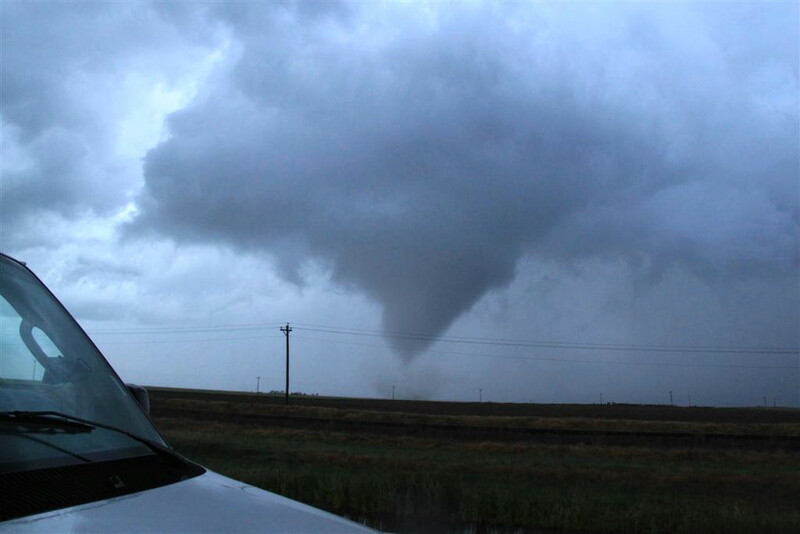 We blasted west to get out of the way, then turn around as a big cone tornado spun away in the field across from us near Bartlett, CO. Uh, Matt, the road is THAT way!! Awesome cone tornado! When this formed, it was probably not more than 100 yards from us, and once again, we got a closeup look at a group of trees disintegrating. Speaking of trees, note the cottonwood tree in mid-air, between the two power poles, as the tornado wipes it out! 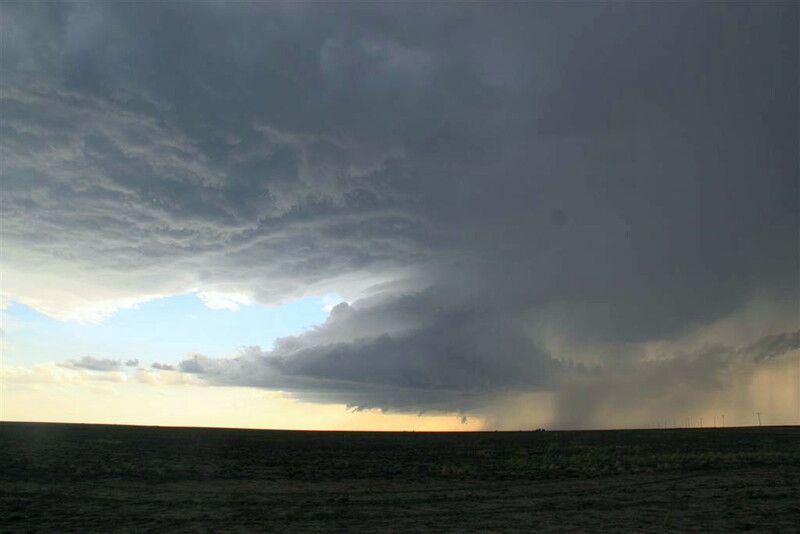 Wider shot to include the whole mesocyclone. 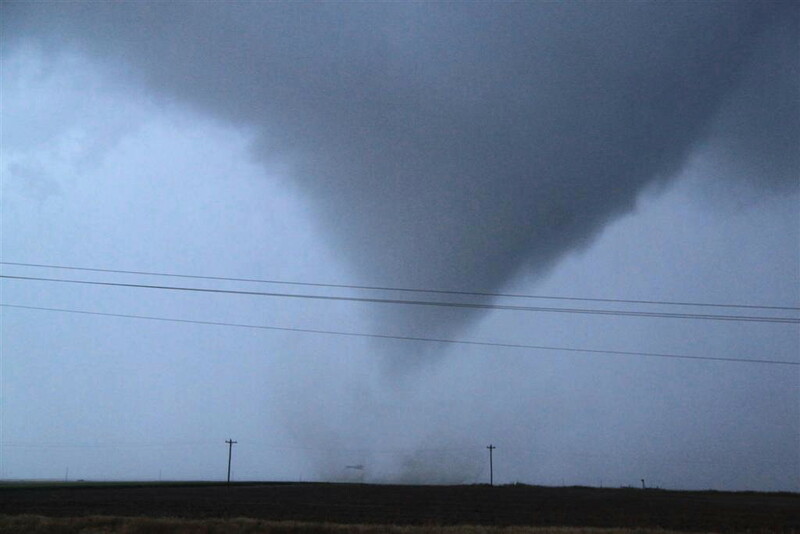 Video screen capture as the tornado begins to rope out. It did significant damage to the group of trees in the picture. I find my ability to have a power pole in front of my shots almost uncanny. 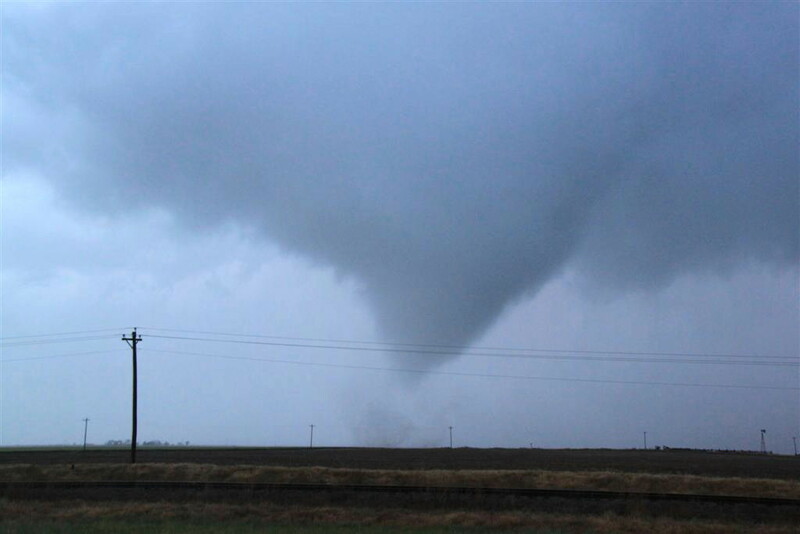 Zoom to get a feel for where we were relative to the tornado. Awesome ropeout!! Broader view of the ropeout. Better focus this time... Wow!! 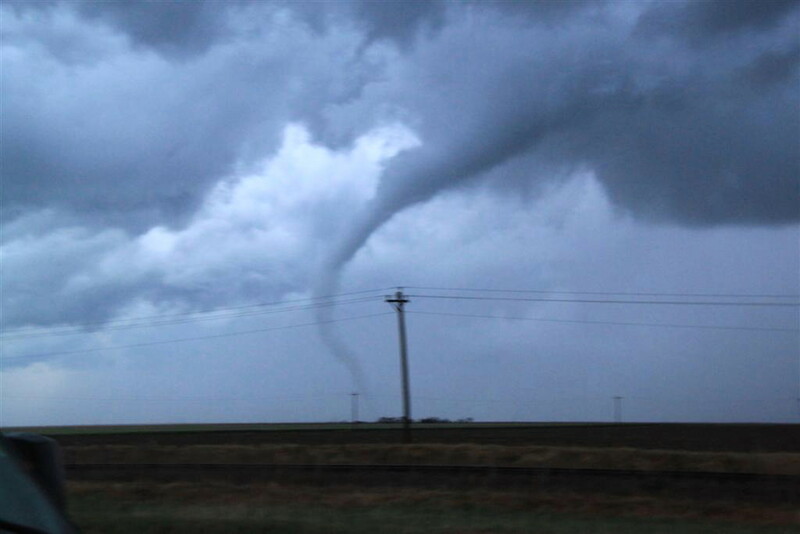 The tornado finally dissipates with a last wispy rope, then it was off to Lamar for the evening.